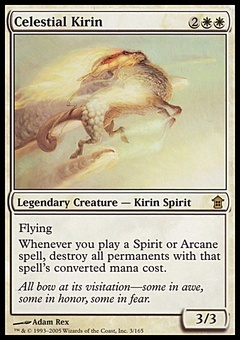 Sarkhan, the Dragonspeaker ($0.90) Price History from major stores - Khans of Tarkir - MTGPrice.com Values for Ebay, Amazon and hobby stores! Card Text: +1: Until end of turn, Sarkhan, the Dragonspeaker becomes a legendary 4/4 red Dragon creature with flying, indestructible, and haste. 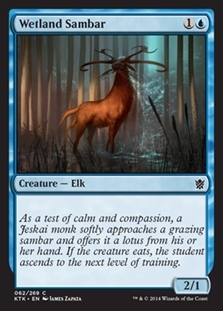 (He doesn't lose loyalty while he's not a planeswalker.) 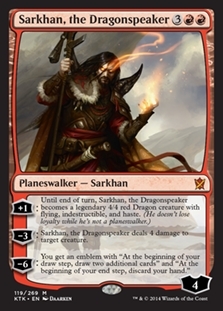 -3: Sarkhan, the Dragonspeaker deals 4 damage to target creature. -6: You get an emblem with "At the beginning of your draw step, draw two additional cards" and "At the beginning of your end step, discard your hand."